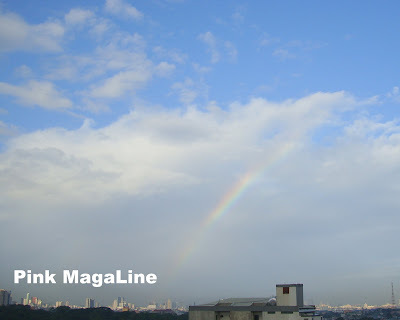 I saw this rainbow over Manila a week ago. 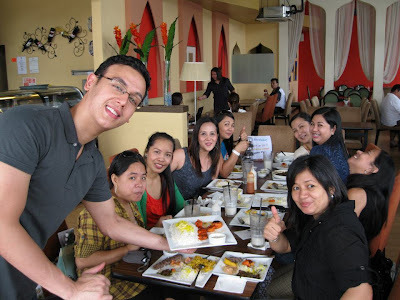 That day, I had a lunch date together with some fellow bloggers and Persia Grill's owner and former PBB housemate and Trip na Trip host Kian Kazemi. I thought of the rainbow as a sign to wear something colorful that day. Hence, I did not hesitate wearing a mix of colors for my outfit. The colors of the rainbow are red, orange, yellow, green, indigo, blue and violet. The rainbow colors present in my outfit were red, orange, yellow, green, and blue. What I wore: earrings, ring and orange ruffled top from Forever 21 and red bangle, gift from a friend, and Figlia sandals. Orange bangle and jeans from SM, green cardigan from Landmark, and DIY leopard shoulder bag. Kian Kazemi personally treated us with yummy food. A very kind and accommodating restaurateur. Thanks for the lunch Kian! Looking good sis! :) Love your leopard shoulder bag. Good captured of rainbow, darling! And when did you go home? Can i have that green cardigan? Green is my favorite color. FYI. What's your favorite brand of flip-flops?